Happy international woman’s day to all of you out there!!! Intensely pigmented and brilliant, Ultimate Pen Long Wear Eyeliner’s texture adheres perfectly to the lid, tracing a full line that holds over time. The “capillary system” technology allows it to release the ideal amount of formula, for maximum control during application and a flawless result, without smudging. Super easy to use, thanks to its innovative ergonomic design and its “anti-slip” grip, Ultimate Eyeliner allows even less experienced users to get extremely accurate and professional results. Up to 24hrs of rich, intense colour that doesn’t flake, smudge, smear or run. Waterproof formula. Professional brush for complete control to draw the lines you want. These luxurious eyeliners apply as smoothly as a liquid with the precision of a pencil. They are waterproof and super long lasting with more than 8 hours wear! Line and define with Ink Pot Eyeliner’s intense black gel formula. This innovative eyeliner glides on smoothly without flaking, smudging or budging, making it crease proof for a guaranteed look that lasts all day. Good morning people!!! Another boring-ish Monday has come!!! Let’s make it colorfull! So Beauty Line cosmetics is a greek cosmetics company ,as i learn today, and really cheap. The products have a very good quality compared to the prices. My personal favorite is the matte lipgross. It is so cream and light at the same time. It’s long lasting and you can drink or eat without worries. 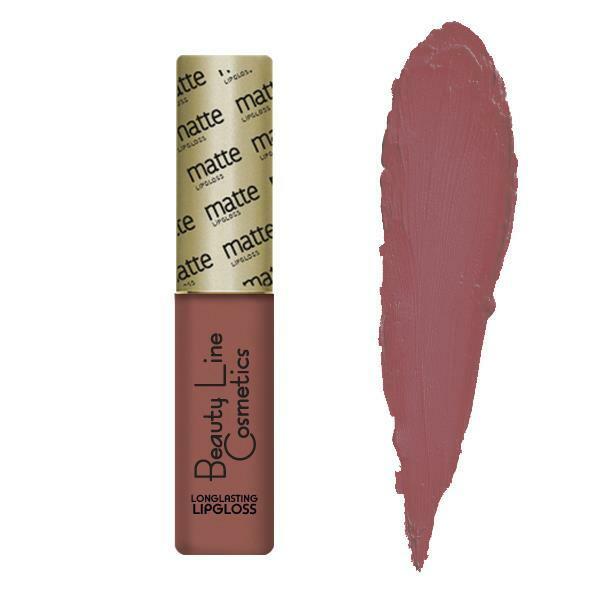 What i love the most about it is the totally and completely matte finish! It looks like you’ve put on lipstick or lip pencil. No shimmer at all whatsover! Just matte dry looking gorgeous lips!! So far i purchased 3 shades of this lipgloss but i am going for the whole palette!! If the official company online shop doesn’t ship to your country you can always try to find it on ebay or amazon! If you are having trouble finding it just comment down below and we will find it for you!